YOU GUYS! I taught a yoga class to 20 TOTAL STRANGERS last night! Aaaand it was awesome. I still get super nervous to teach, but I figure after a few weeks of teaching 3x per week I should be pretty comfortable with it — which is the goal! I know I enjoy it, and that I need to practice it … so I’m loving that I now have the opportunity to do so in Portland! YAY! It’s pretty fun to observe myself, as weird as that sounds, as a super-new yoga teacher. I get REALLY nervous to teach, spend way too long planning a class, worry I’m going to forget my sequences or say something ridiculous, etc. But then I get to class and say all this stuff and THE BODIES MOVE! It’s crazy. This is the most fun part: I say “from ____ move your ____ to ____” and THEY DO IT. As I type this I see this makes me sound like a total control freak. Maybe I am, but it’s just so darn cool to see things happen after hours of planning and practicing something myself. Aaah the ‘new yoga teacher’ chronicles. I’m sure this will all fade quickly into the past and come more naturally, but as awkward as it can be: I’m loving it. While I was in my teacher training at the Yoga Barn in Ubud, I’d often order a treat from the cafe during our afternoon break. Usually that meant hummus (swoooon) and a latte … but this hot honey ginger lime tea snuck its way into my routine pretty often, too. It seems so simple — I mean, it is so simple — but there is something about it that I can’t get enough of. It’s warm. It’s sweet. It’s tangy. It’s fragrant. It’s pretty much amazing! Seriously, it IS amazing. This is one of those recipes that you’ll fiddle around with to get it to taste how YOU want it to taste. More/less honey for more/less sweet, more/less ginger for more/less zing, etc. The key here is to be patient and cover the mug/glass while the ginger steeps! You want to give it some time to bring out the ginger flavor, without losing too much heat. Use the hottest water you can, pour it over the thinly sliced ginger, cover it with a lid (I use a yogurt lid) and let it sit for 5 minutes or so. Then, stir in the honey and lime. AND ENJOY IT! 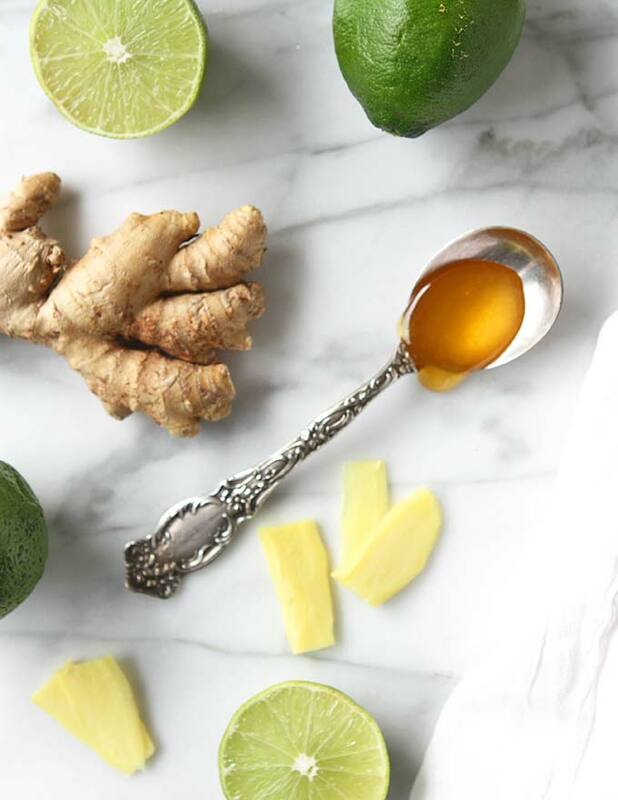 Peel the ginger (use a spoon and scrape!) and cut into very thin (pretty much as thin as you can get them) slices. Put the ginger in your mug or glass, and add boiling water. Cover with some sort of lid, and let steep for 5 minutes. 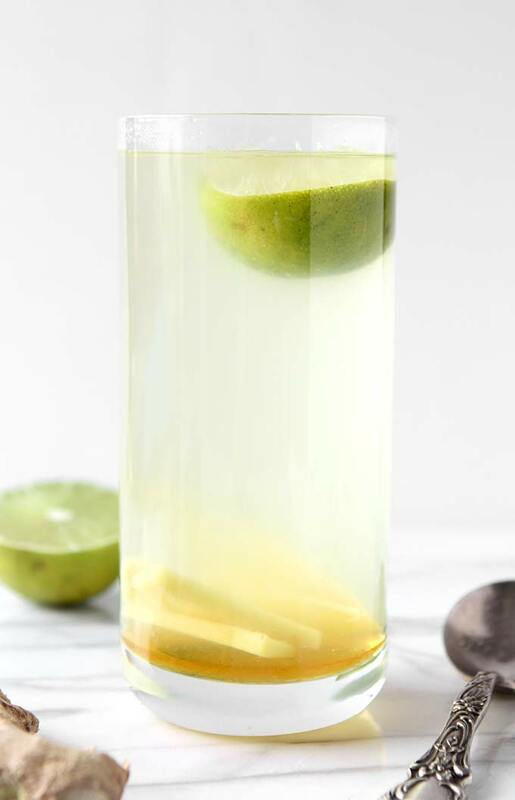 When the ginger has steeped for five minutes, add the juice from the lime (and then the lime itself) and honey to your desired sweetness. Stir, and enjoy! This sounds so delicious! I bet it would be the perfect thing to drink if you have a cold, too. 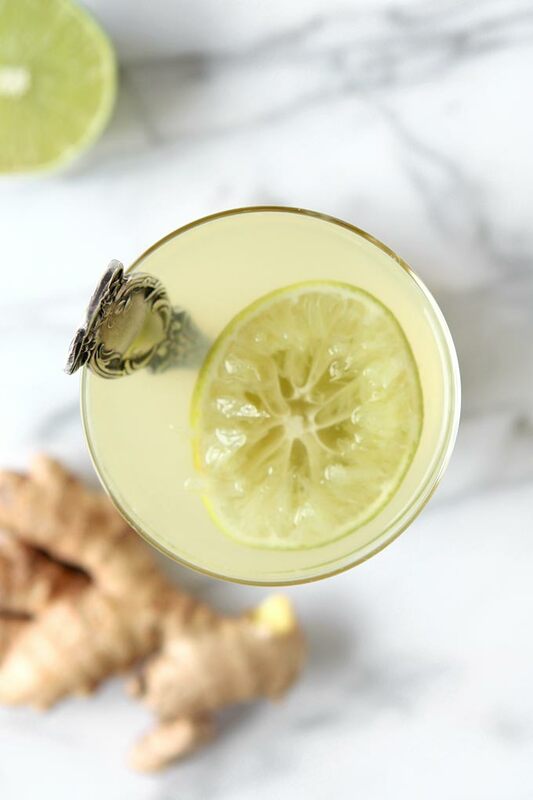 Citrus and ginger for the win! Absolutely! It makes you feel like a million bucks! Thanks, Eileen! I drink 17 floz (0,5 liter) almost every day and I haven’t been sick for over a year. Maybe it’s some kind of placebo because it’s supposed to be healthy, but it works for me so I don’t question it. In my ginger-lemon-tea I also add sage. You should try that, too. I use a thermo mug to make the tea so I led all the indigrients steep for at least half an hour and I can drink it where ever I like. And in summer I drink it as iced tea, which is also very delicous. I add fresh ginger H20 to my coffee (prepared like you do only I grate mine on a planer) + 1TB coconut oil – figure I might as well get some good things to compensate for the coffee/caffeine which I only drink a few gulps of daily tho! Sounds like a great plan!! Thanks for the tip!